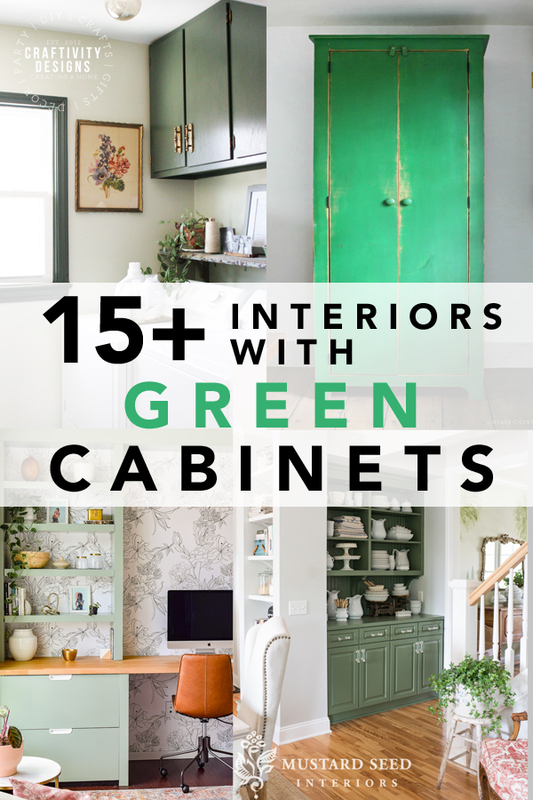 Embrace green cabinets in your home. Dark green, olive, sage, and kelly green cabinets have been popping up in kitchens, laundry rooms, bathrooms, and more! The Jan/Feb 2019 issue of Country Living claims that “green is the new neutral.” They must have consulted me (yeah, right) because I’ve been saying that for years! 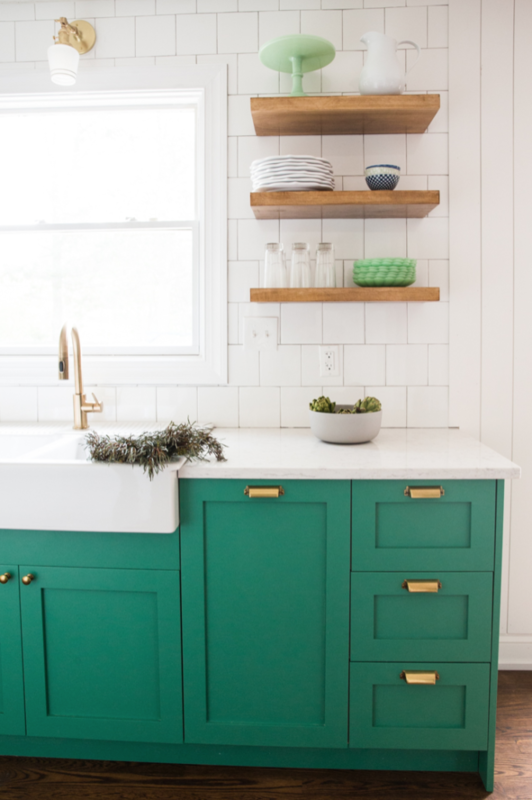 Still, I chose green cabinets for our Vintage Laundry Room way back in the summer (well before CL’s issue was released), so maybe I can claim a *tiny bit* of early trend-spotting, right?! My last name is “Green,” so maybe I come by my love for the color naturally, right?! Truthfully, I’ve loved it since long before I married and became a “Green.” Likely, due to its natural appearance throughout nature. Shades of green exude life, freshness, and energy. 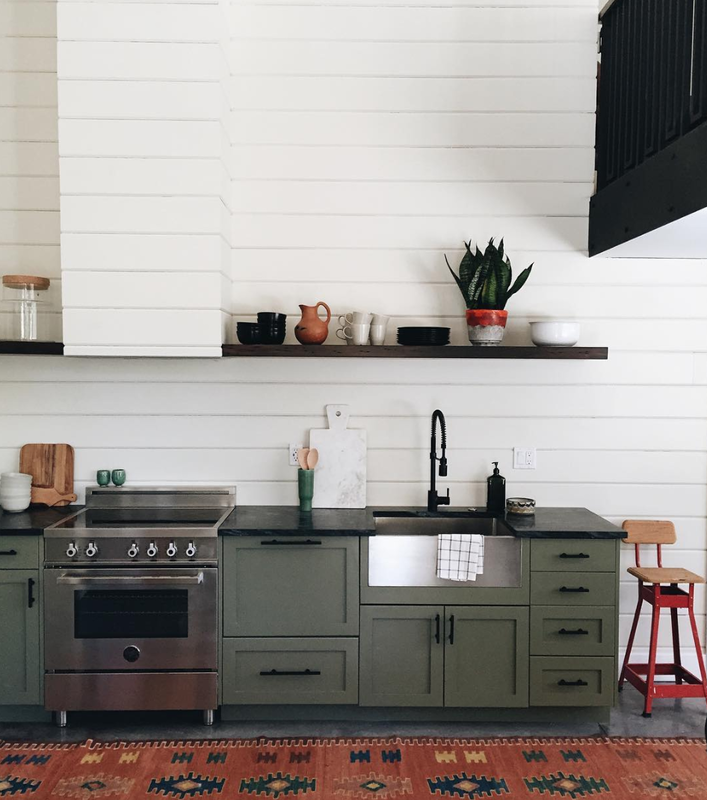 In today’s post, we’ll take a look at dark, mid-tone, and light green cabinetrys in a variety of rooms from kitchens to laundry rooms. Hunter green, forest greens, and olive green are all in the dark green category. Some green paint colors are dark enough that they can read deep gray or nearly black in certain lighting. 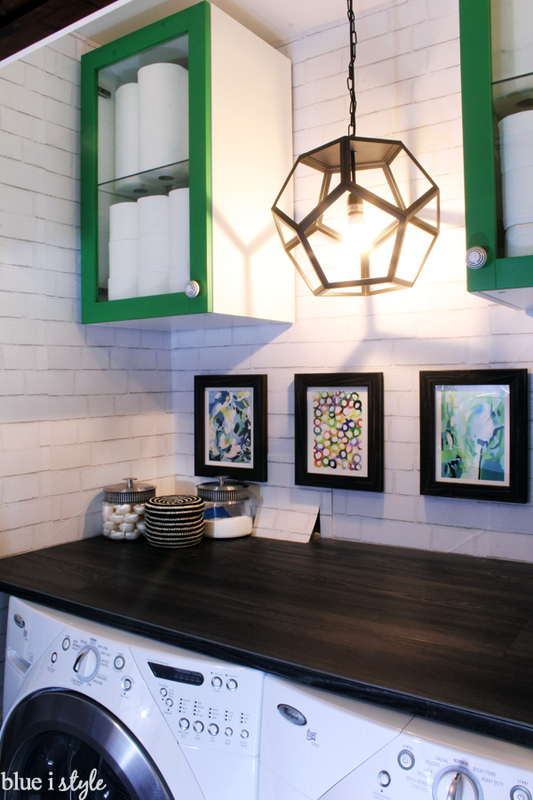 Studio McGee chose a hunter green for the kitchen remodel in their Denver Tudor project. 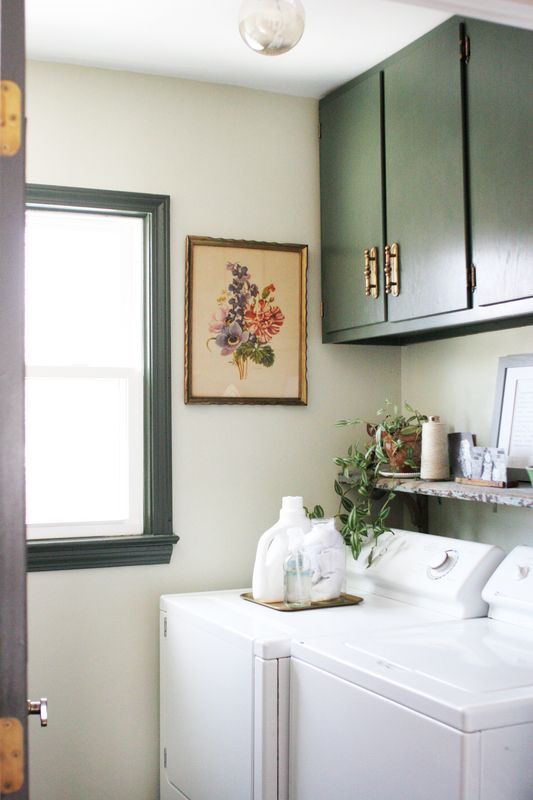 I chose a forest green cabinet color (and trim) for our vintage laundry room. 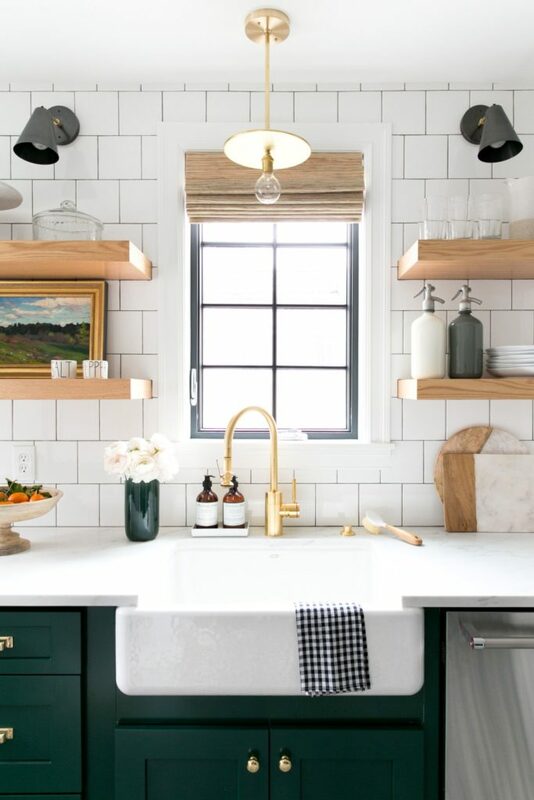 Jenny Komenda used an olive green on shaker style cabinets, paired with shiplap. 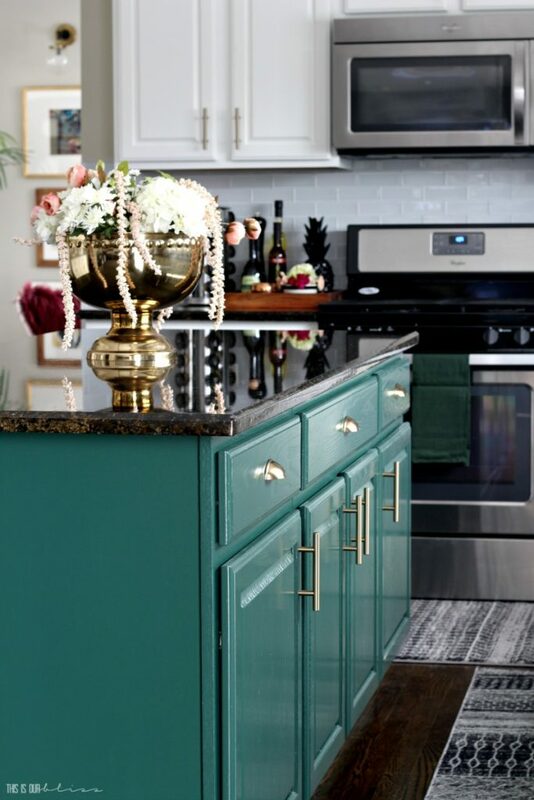 This is Our Bliss included a hunter green island in her kitchen makeover. 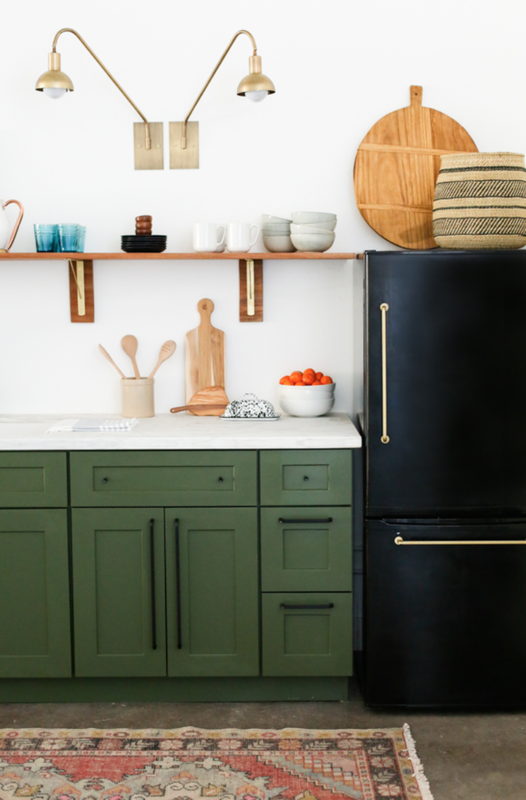 Juniper Home chose a dark olive for the shaker style cabinets in the studio kitchen. Moss green and kelly green are included in the mid-tone green paint colors. 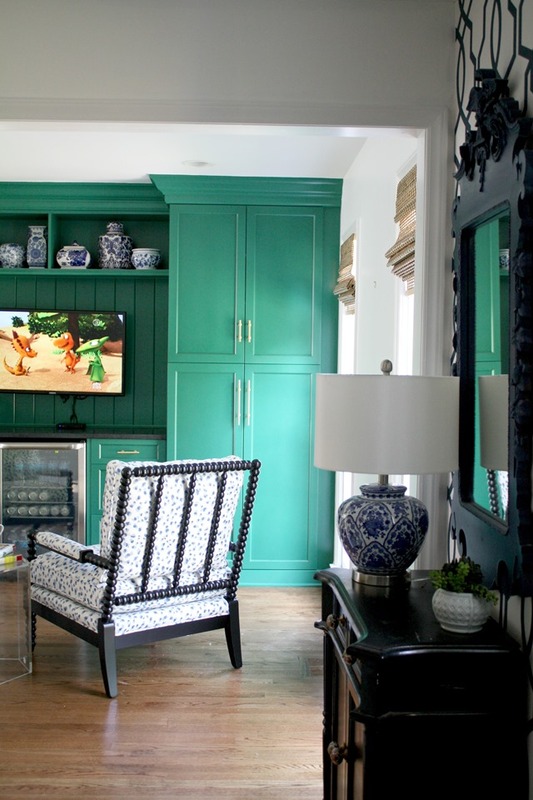 If a dark green cabinet feels too intense, a kelly or moss green is a fresh, lighter choice. Miss Mustard Seed painted her builder-grade butler pantry a moss green shade. Live Free Creative Co. renovated a small kitchen with kelly green cabinets. 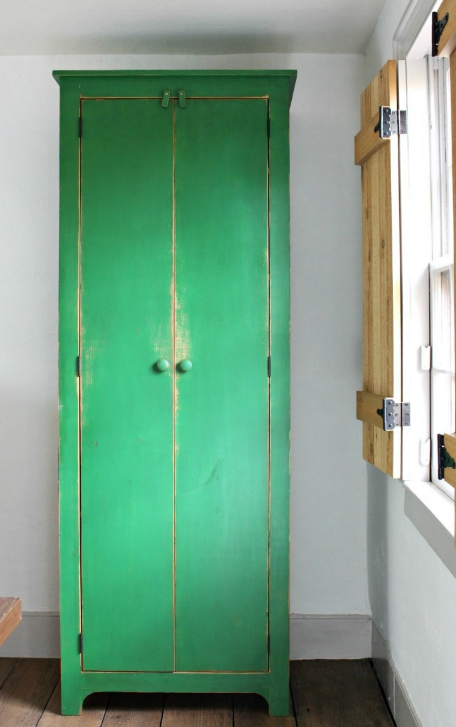 Jamie Costiglio built a tall cupboard and painted it a gorgeous green. 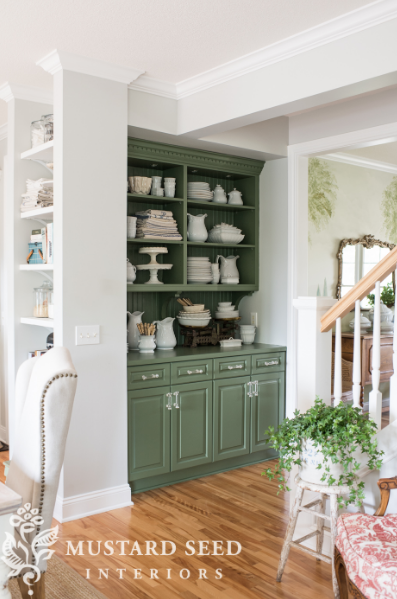 Emily A Clark chose a jungle green for the cabinetry in her keeping room. Blue i Style included kelly green cabinets in her laundry closet. Sage green and mint green are both included in the light green color range. Sage green is a bit warmer in tone, while mint green leans cooler with hints of blue. 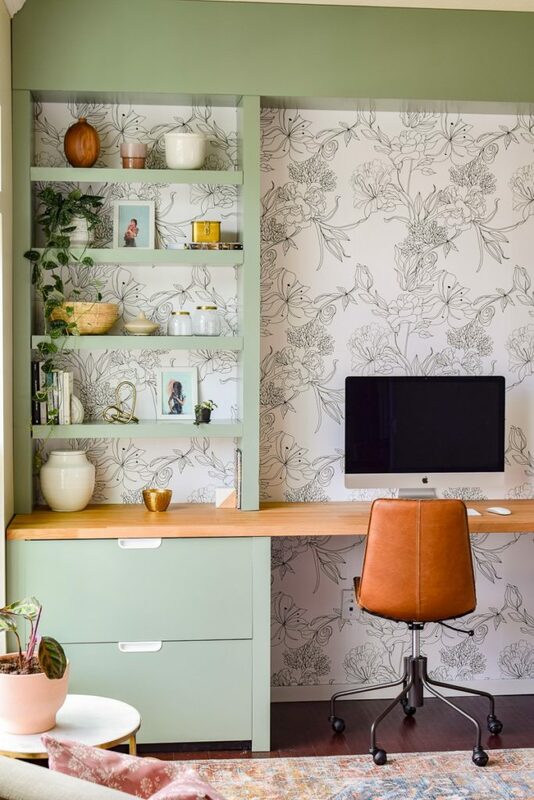 Making Joy and Pretty Things chose mid-tone sage green cabinets for her modern office. 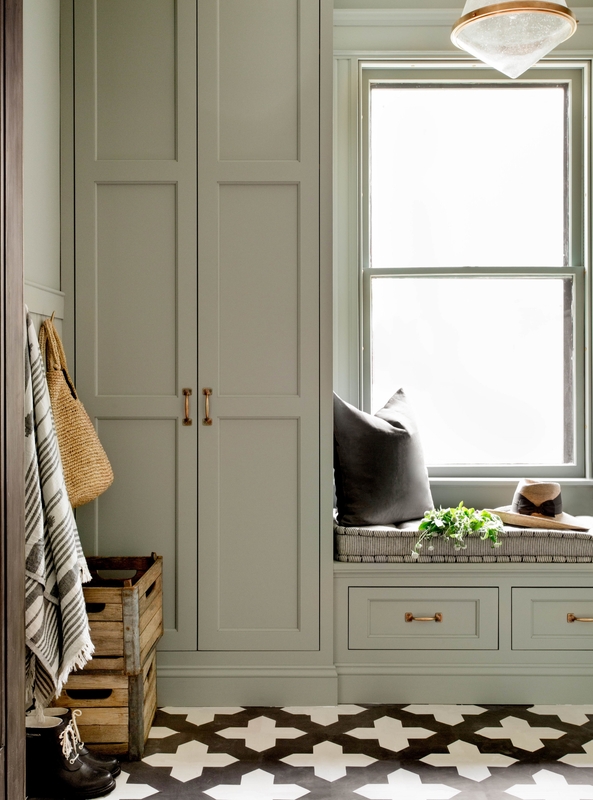 Becca Interiors used a sage green in this mudroom, paired with stunning black and white tile. 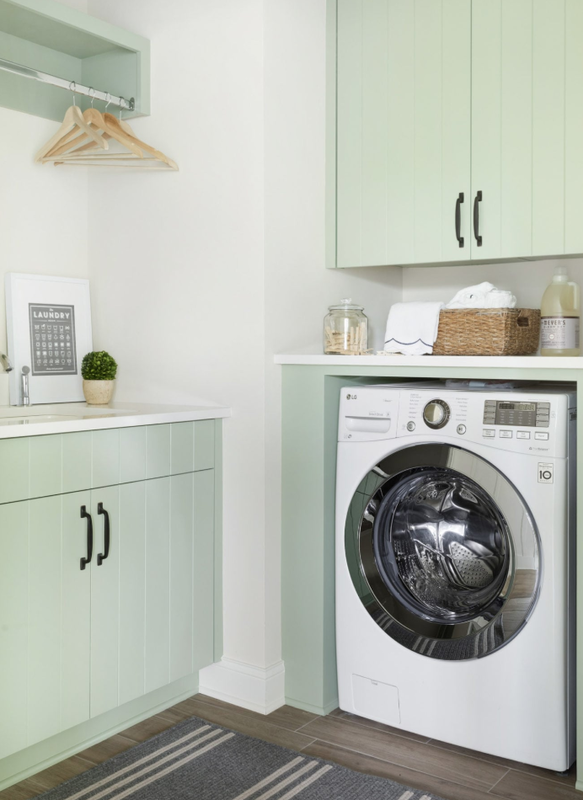 Bria Hammel chose a refreshing, mint green for this laundry room in the Lakeville Farmhouse. 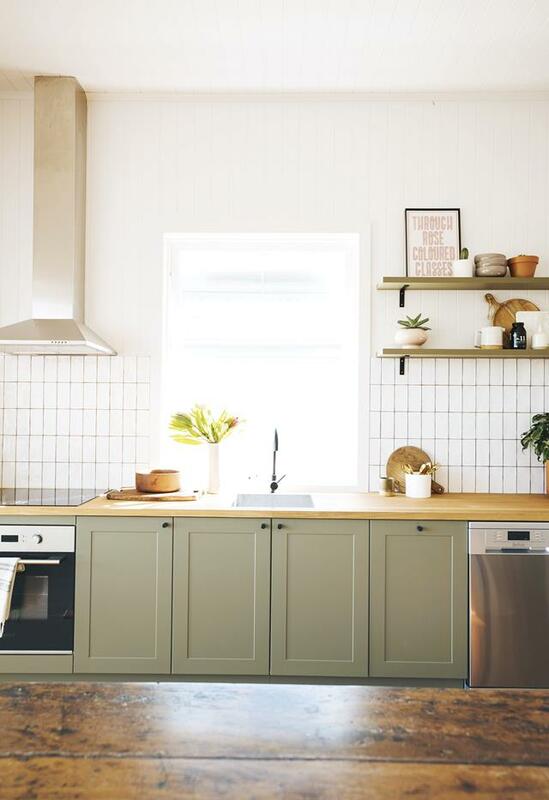 Geneva, of Charlie & Rose design firm, included sage green cabinetry in her Brisbane cottage reno. 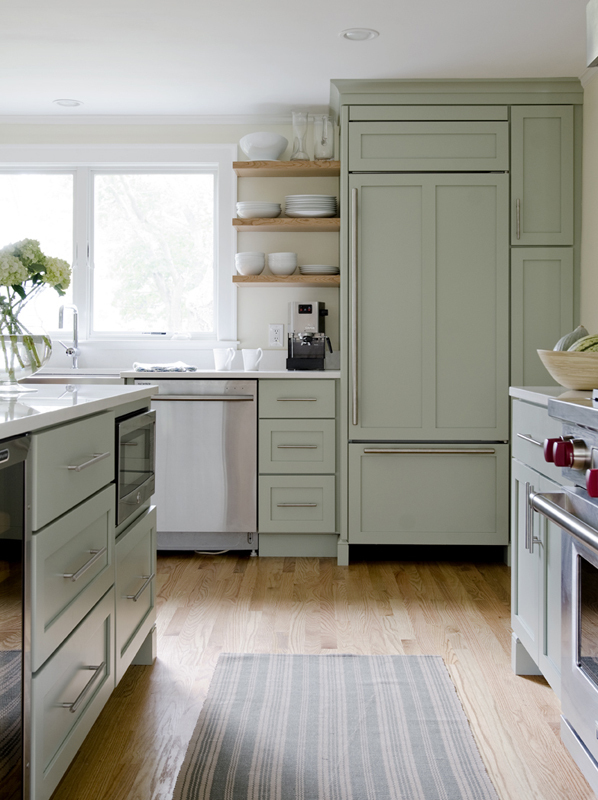 A softer, mint green on these cabinets, by Kitchen Cove Cabinetry, pair perfectly with light oak floors. So, are you ready to embrace green cabinets in your home? Why, or why not? Would you embrace any color – other than wood stain or white – on cabinetry? If, so which color? I’d love to hear your thoughts.